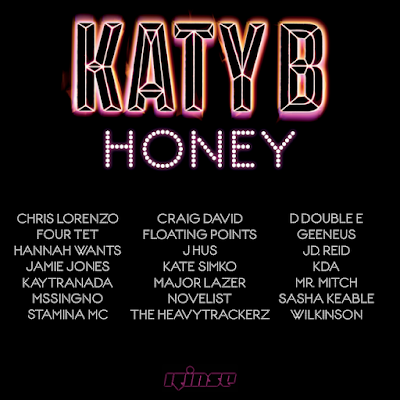 Katy B will release her massive collaboration album, Honey, in April. Take a look at the cover, above, and the tracklisting, below and hear the record's title track. 01 Katy B x Kaytranada: "Honey"
02 Katy B x Major Lazer x Craig David: "Who Am I"
03 Katy B x Wilkinson x Stamina MC: "So Far Away"
04 Katy B x Sasha Keable x JD Reid: "Chase Me"
05 Katy B x The HeavyTrackerz x J Hus x D Double E: "Lose Your Head"
06 Katy B x Chris Lorenzo: "I Wanna Be"
07 Katy B x Four Tet x Floating Points: "Calm Down"
08 Katy B x Mr Mitch: "Heavy"
09 Katy B x KDA: "Turn the Music Louder (Rumble)"
10 Katy B x Jamie Jones x Kate Simko: "Dark Delirium"
11 Katy B x MssingNo x Geeneus: "Water Rising"
12 Katy B x Hannah Wants: "Dreamers"
13 Katy B x Novelist x Geeneus: "Honey (Outro)"